The Victorian Government has identified the preferred bidder to deliver the $6 billion ‘Tunnel and Stations’ Public Private Partnership package of works on the $11-billion Metro Tunnel Project. The preferred consortium responsible for the design and construction of the project’s twin tunnels and five underground stations, the Cross Yarra Partnership (CYP), comprises world-class construction and tunneling contractors including Lendlease Engineering, John Holland, Bouygues Construction and Capella Capital. The announcement came after what has been described as an extensive and competitive bidding process for the twin nine-kilometer rail tunnels project that will run from South Kensington to South Yarra. The Melbourne Metro Rail Authority’s (MMRA) focus is to not only create easier access rail travel for locals and tourists, but to also build more sustainable infrastructure than previous projects. According to their Sustainability Principles and Approach document, released in April 2016, the MMRA wants to improve environmental protection, public perception, design longevity, more resilient systems and social inclusion through the project via the selected contractors. The MMRA’s Director of Delivery and Development Peter Wilkinson will be discussing this and other Metro Tunnel updates at the 8th Annual Victorian Major Projects Conference on the 28th and 29th of November at the Melbourne Convention & Exhibition Centre. Speakers at the conference will discuss major infrastructure projects throughout Victoria and will revolve around the state government’s $9.6-billion injection of funds into the Victorian infrastructure arena in response to both predicted population and economic growth. The two-day conference will see over 200 senior executives from both private and public sectors attend educative and innovative presentations regarding the states infrastructure projects. Wilkinson has over 30 years’ experience within the industry, and has worked on projects both nationally and internationally. Now currently overseeing the design and delivery processes of the Metro Tunnel, part of Wilkinson’s position is to confirm that both the project’s design and construction fits into the MMRA’s outlined sustainability framework. The MMRA will work with contractors in development stages using modern-design techniques to make the new stations as sustainable as possible. Part of the project’s plan requires CYP to optimise environmental technology and thinking to utlise energy, water and material saving initiatives in the stations’ designs. This was outlined to ensure that Melbourne's increasing number of infrastructure projects leave a more environmentally and resident friendly city. The stations being delivered as part of the tunnel project are at Arden, Parkville, CBD North and South and Domain. The new designs were created with the aim for the buildings to seamlessly fit into Melbourne's existing and developing infrastructure, the Victorian Government's Urban Design Strategy and were influenced by other international building projects such as the London’s Crossrail and New York's Second Avenue Subway Project. MMRA will create public precincts with an individual twist on each new station included in the project. 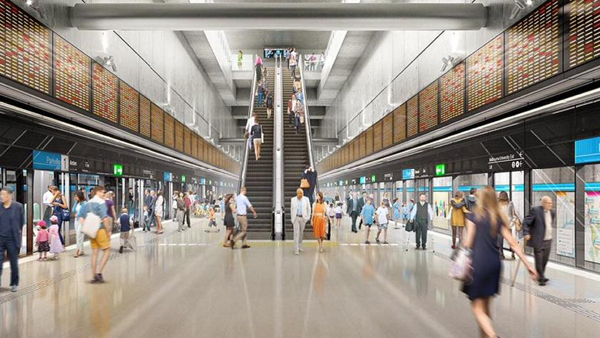 Recently released concept images of the project reveal wide platforms, pedestrian tunnels connecting the new stations to the City Loop and open above-ground precincts. Features to note at each station include: Arden's transition from industrial to a more welcoming commercial and residential space, Parkville's underground entrances to the Royal Melbourne Hospital, the CBD North and South stations will have underground connections to City Loop stations and Domain station will have a train-tram interchange and its design will be respectfully reminiscent of nearby destinations such as the Shrine of Remembrance, through architecture including a floating timber canopy. In the past, the Victorian Government has released public documents featuring sustainability to further ensure that new infrastructure will leave a smaller impact on the surrounding environment. These included the Transport Integration Act 2014, which includes the promotion of optimal environmental performance of all new transport systems and the energy that fuels them; the Climate Change Act 2010, an act that requires all new projects and designs fit into the framework of risk assessment plans and ensures that infrastructure will be resilient for at least 100 years and Plan Melbourne 2017-2050, a plan to guide the growth of Melbourne for the next 35 years. MMRA’s Environmental Effects Statement planning documentation also outlines that the project’s construction process should minimally impact biodiversity structures in impacted areas. Further detailed design is assisting with protecting and increasing vegetation, the continual growth of ecosystems and the maintaining of habitats and other biological factors. Sustainability and environmental footprints in infrastructure will be further discussed at the upcoming Major Projects Conference; as there is an increasing call from the community to governments to protect biodiversity. This will be touched on during talks regarding waterfront projects . Another prevalent topic speakers at the conference will be presenting on is the creation of thousands of jobs for Australians, including the integration of apprentices, trainees and cadets. These speakers include Gregory Anderson and Julian Lyngcoln. The Metro Tunnel is due to be completed by 2026 and will cause some service disruptions during the construction process. The 8th Annual Victorian Major Projects Conference 2017 will run on the 28th to the 29th of November at the Melbourne Convention & Exhibition Centre.